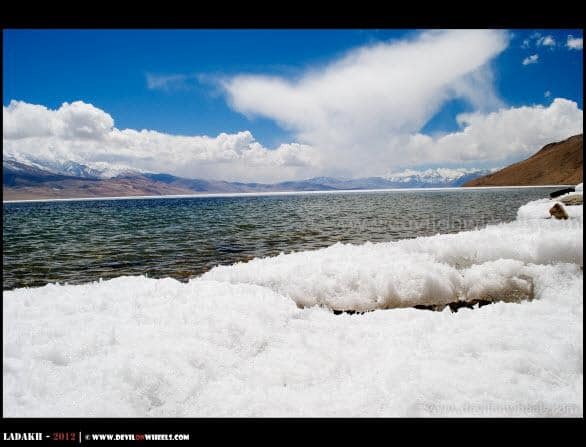 The plan was to visit Tso Moriri lake, spend sometime there and then head towards Hanle to sleep overnight. We continued along the main road, deep into the valley towards Mahe first where after submitting the permits we had to take right diversion across the famous Mahe bridge towards Sumdo – Tso Moriri (Korzok Village). 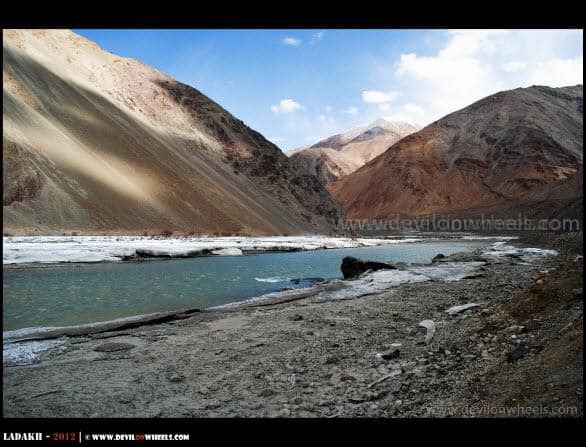 The main road from Mahe leads you towards Nyoma – Loma – Tsaga – Chusul and ahead… As we moved along the Indus river we saw huge frozen parts still floating into the river and even the Indus was still frozen at many sections. It was treat for us though 🙂 … Finally, at about 8.50 AM we reached Mahe bridge, took couple of shots as Rigzin handed over the permits, distributed few chocolates to the 2 children waiting for some shared taxi/bus to go to Nyoma. We had to go towards Sumdo – Tso Moriri, so we crossed the bridge and entered the narrow valley. Taking picture of Mahe bridge and bridges ahead into the Changthang region is prohibited being sensitive area and one must take care of it. As we moved along a small river/tributary that meets into the Indus river, we saw huge amount of snow still present in the river or on the bed/shores around. Water was almost frozen in its majority of sections and we even came across ice on the roads. All this because this part of the region get hardly any sunlight. It was fun watching such vistas enroute and we soon reached Sumdo Village. 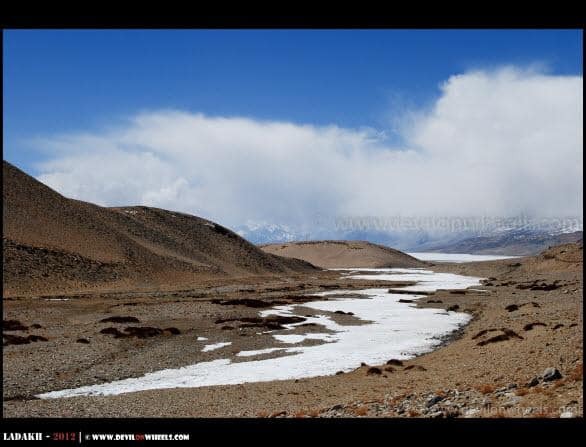 Upto now the road conditions were fine but the tarred road ends at Kiagar Tso and after that all you have is a bumpy, dirt track leading you all the way to Tso Moriri… There comes a wide section on the road that almost look alike Moore plains with huge flat lands surrounded by beautiful multi colored mountains… Everything was frozen around, small water crossings, water in the small river running aside and we were praying that we see at least few colors in the beautiful Tso Moriri lake. 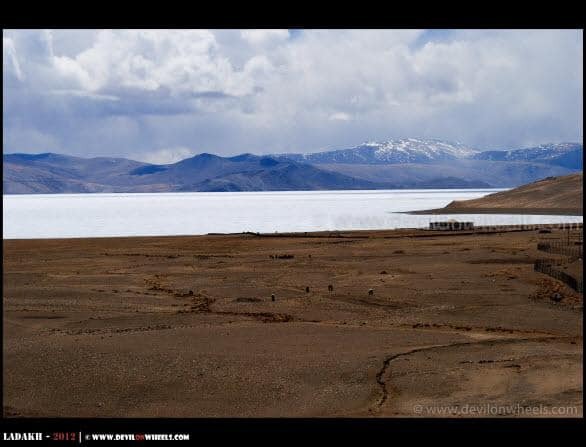 Soon the eyes lit up as we had first views of Tso Moriri but it looked all frozen… Slowly and steadily on the bumpy road we by passed some temporary houses build by people of Changpa tribe, the nomads of Changthang. 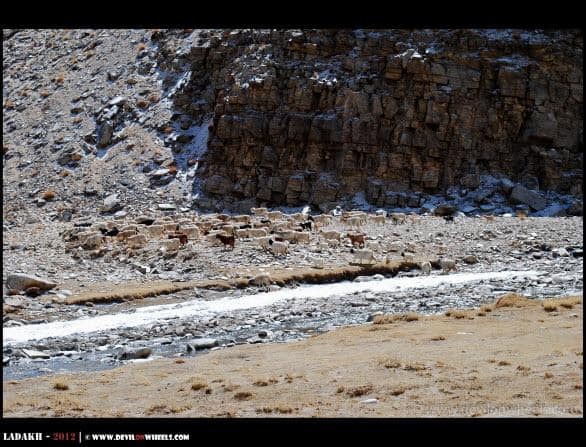 They had herd of sheep with them which produce the costly Pashmina shawls… As we approached near the banks of Tso Moriri, we were happy to see at least about 30% of it had melted, enough to let us see some beautiful blue colors of it. The beautiful multi shades of blue color offered by this lake along with a picturesque landscape around gives this place an extremely romantic feel and breath-taking feel. 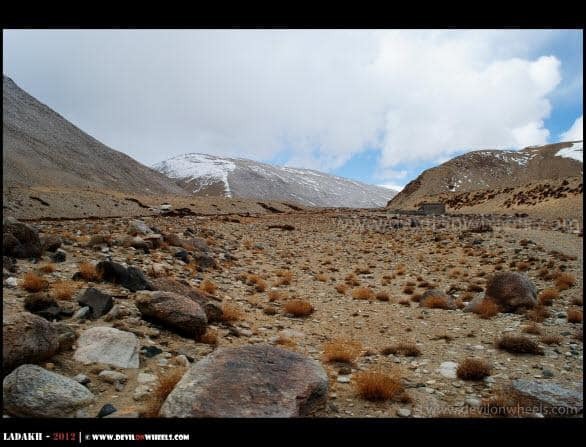 However, in actual reality the place is extremely harsh and difficult to survive especially in winters. There is only one cemented accommodation available around the lake and the facilities like electricity, medical aid, hot running water, western toilets etc. are rare to find. The lack of oxygen makes survival difficult if your body is not properly acclimatized to its high altitude and hence, one need to plan his/her journey extremely carefully to make it acute mountain sickness free vacation. And refer to this article, I think it’s the option that u wrote yesterday. 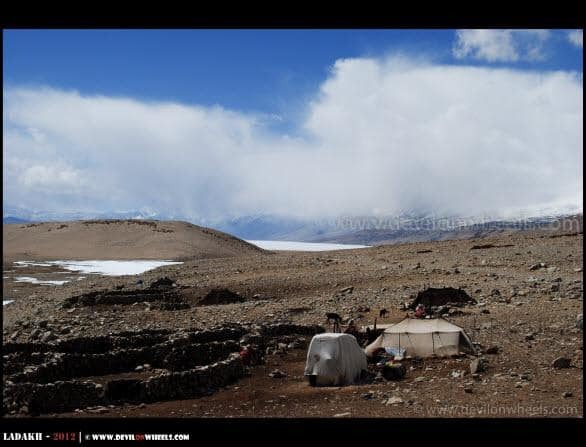 Stay at Chumatang before heading to Tso Moriri next day… Right? 1. Where is at Chumatang part that we can stay? Can u suggest some places? Hanle, foreigners are not allowed. So, it has to be Chumathang only. And yes, the rest of the plan is good. 1. Chumathang has just one hot spring guest house, basic place to stay with decent food. 2. Hanle is not allowed for foreigners. 3. 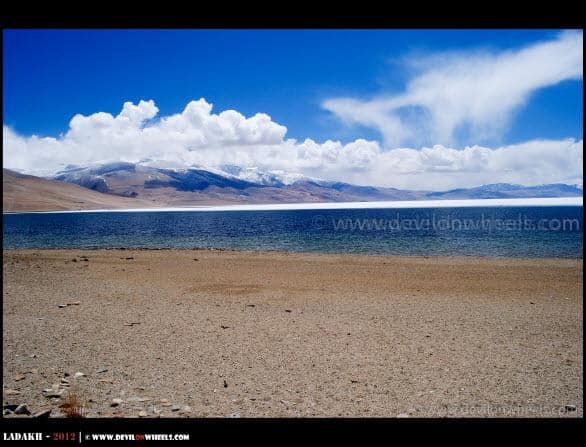 Yes, you need permits for Nubra Valley, Pangong Tso and tso Moriri. Indeed, you will enjoy the trip alot. what would be the weather like in second half of june. It will be a bit cold especially at the passes and lakes. Do carry woolens with you. Wanted to ask 1 thing, i am planning a 7days trip to Ladhak and on 8th day mrning will be leavinf for srinagar, on 11th day afternoon i have flight from srinagar already booked. Now as per your advised itenory, 1st & 2nd day in and around leh relaxing. 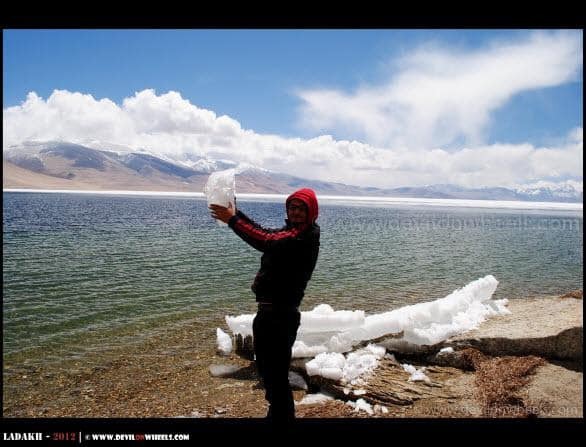 3rd day Nubra stay, 4th Day Back to leh, 5 Pangong and 6th back. 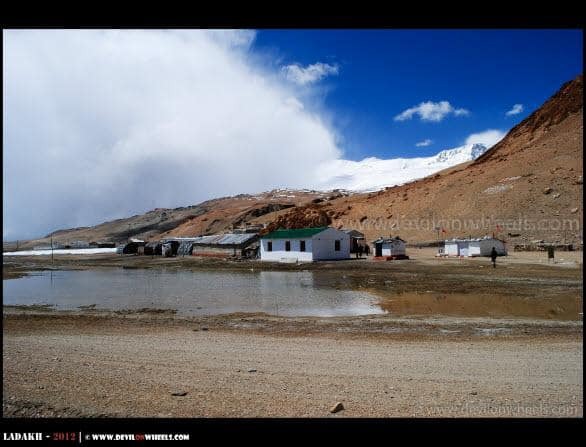 i have a buffer day for 7th day and planing to go to TSO Mori, is it a day visit and in which route it is and what will be the best day to go i mean after Nubra like that as i can shift a day to ladhak and leave on 9th day. 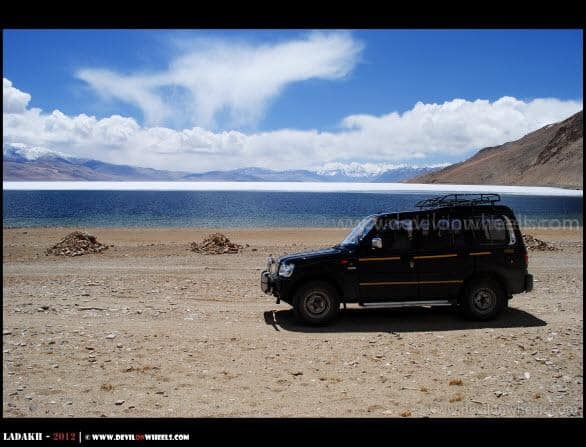 Tso Moriri cannot be done in single day though you can do Pangong Tso in single day and do 2 day trip to Tso Moriri. howvere, to keep it easy will suggets you take rest on the last day. 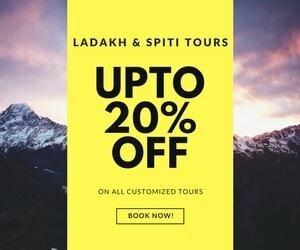 I can help you plan the trip on yourself by sharing all the required info possible or I can refer one of my Destination Sponsor if you are interested in complete tour, who will be able to provide any required services you want for Ladakh tour. Well, I generally do not plan any event myself as mostly I travel solo/with family or friends but once a while do post public tours as well on blog’s Facebook page. As of now, no plans for May to July but may be something in September, though nothing certain as of now. just wanted to ask u whether the route from wer the Indian and Chinese bunkers are visible open now????? Sir can u please help me to give Initiary from Manali – Leh tour. As I reach Manali on 17th Aug 2012. Wanna leave Manali on 19th early morning at 03:30 am. 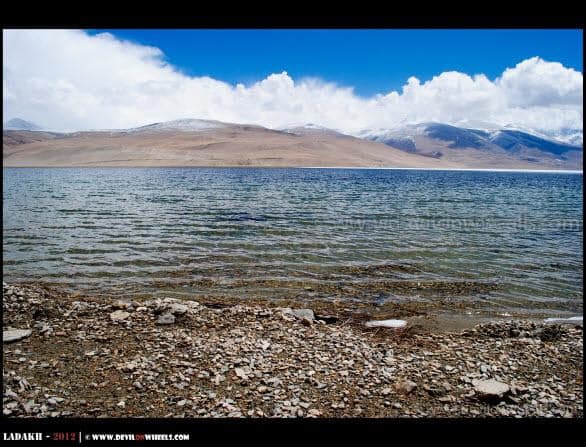 I wanna stay for 8 days in Leh, want to explore almost everything there in Leh like Nubra Valley, Tso Pangong, Tso kar, Tso Moriri, etc etc etc…. If possible I can take more 2 Days. 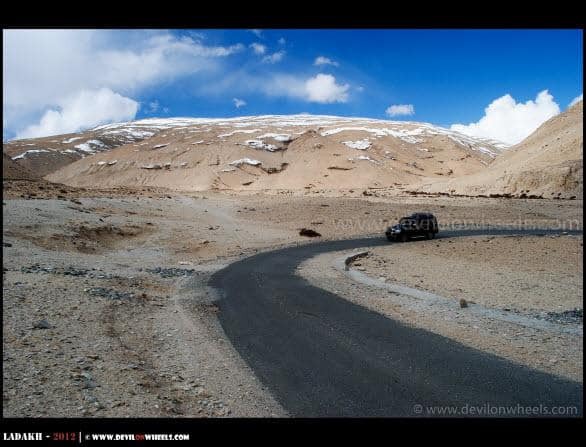 Sir please suggest me the right Initiary to explore Leh in its best. Can u also tell where do i get Snow in the month of August. — It is always better to stay either at Keylong/Jispa so that you do not feel sick or hit by AMS. 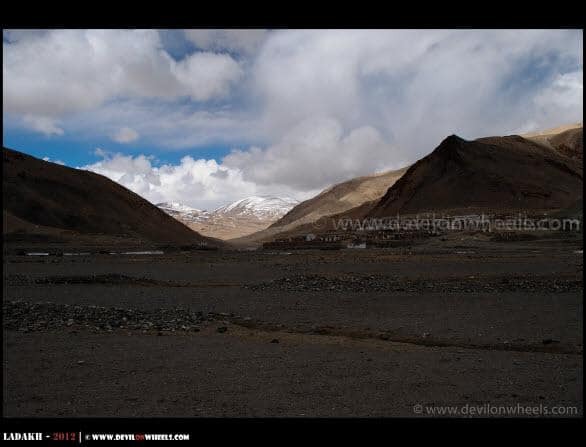 — Avoid sleeping at Sarchu at any cost while going to Leh from Manali because your body will not be acclimatized by the time you reach there. 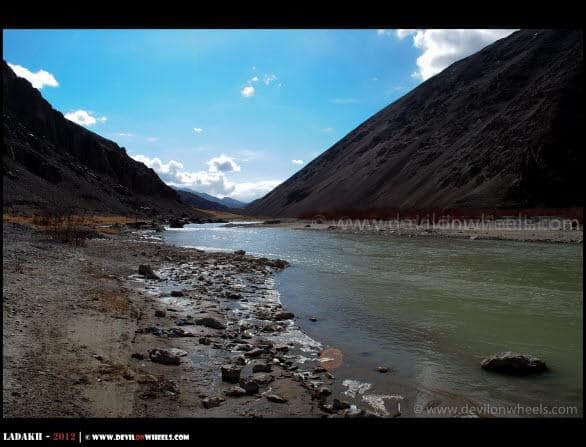 — I prefer staying at Jispa more because Keylong gives the feeling of a town while Jispa is more closer to nature having Bhaga river running just aside the Manali – Leh Highway at Jispa. 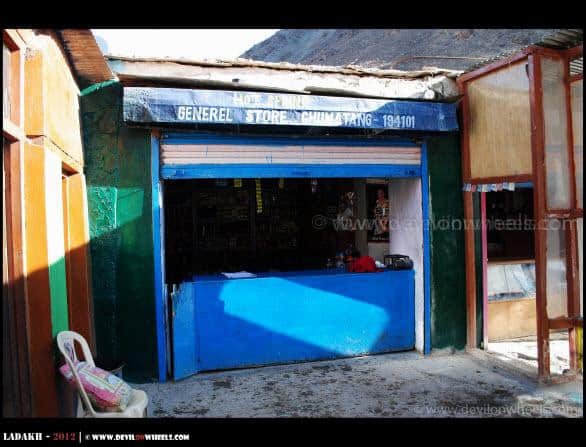 — Leave Keylong/Jispa early next morning, say by 4/5 AM types, so that you reach Leh in the evening. I hope this helps. Let me know incase you need more info. 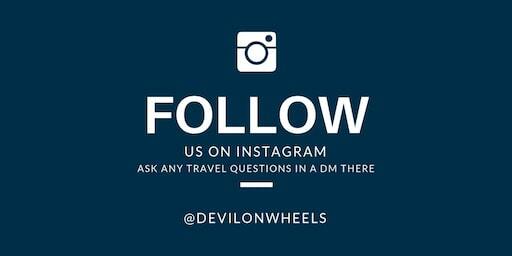 or have any queries or doubts. If possible, then can you tell the distance between these points. Yes, this is possible. 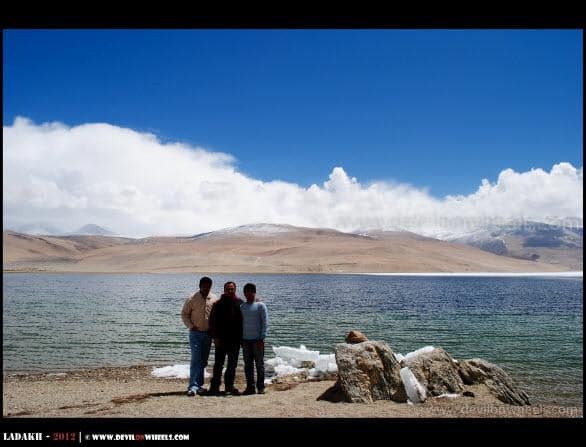 Leh – Pangong Tso – Man – Merak – Chusul – Tsaga – Loma – Nyoma – Mahe – Sumdo – Korzok (Tso Moriri) – Sumdo – Tso Kar – Moore Plains (Manali – Leh highway) – Pang – Sarchu – Keylong – Manali. thanks dheeraj. I checked the link mentioned by you. I am interested in the below routes. Can you please comment whether these routes are doable on bike. Also can you mention the approx travelling distance for each of these routes. I will send you the maps for the same with distances. Please mail me if I forget 🙂 … Just to tell you that, permits for Changthang i.e. Pangong Tso to Tso Moriri are not been issued by DC office. Hence, do not rely on them. Awesome. A pleasure to read and peer at the lovely photographs. Thanks alot glad you liked the pictures. As I said, the place itself is so great and beautiful. What would have been the height of the place where your nose, chin went numb? As usual, your photos are amazing. And the descriptions are quite insightful. Besides, toffees & candies, I also carry some sketch pen sets & drawing books to give to kids. Actually they are so far off that everything and anything we take for them is much appreciated. Sir please I m eagerly waiting for ur reply my tour depends on ur suggestion. I took decision to visit hanle after reading ur article! Please suggest is it safe to go alone over bike there!,otherwise I will have to hire four wheeler which is costly affair. Guess, I have replied it. 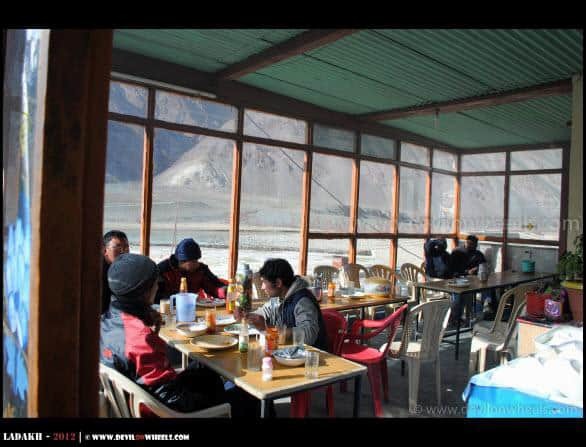 Please also check your spam folder of email box as you would b getting the emails for all the replies 🙂 … This is what I replied earlier "The permits to Man – Merak – Chusul route are still not being given by DC office in Leh, so keep your fingers crossed and hope for the best if they start issuing the permits. Otherwise, you have to take the traditional routes only. In case, you get them then you do need to carry spare fuel with you as their is no fuel pump available in between after Karu and even black petrol/diesel, you might get in either Tangste or Chumathang but very unlikely anywhere in between." Since, you are alone I will not suggest you to visit this isolated route, even if you get the permits, unless you are too much into solo rides and adventure. Day 1: Arrive at Leh : from 6th sept to 17th sept.
visit Shey Palace, Thiksey Monastery, Shanti Stupa, Sankar Gompa, Leh Palace, Hemis Monastery, Stok Palace Museum & the markets. Day 3 : Leh –Nubra Valley. Day 10 : Leh – Lamayuru-Uleytoko. visit Alchi monastery , Likir monastry, Sangam (confluence of Indus & Zanskar Rivers), Magnetic Point, Gurudwara Pathar Sahib, Kali Mata (Temple of Guardians in Spituk monastery) & Hall of Fame. should i stick to this plan and keep close watch on the situation as my travelling date is not too close. Most probably the restriction might last the whole season, but again nothing is certain. 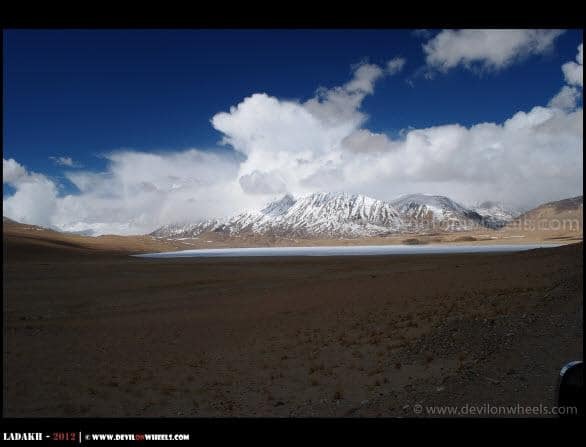 do have a backup plan with you and in such a case skip the Uleytopko and make two day trip to Tso Moriri via traditional route via Chumathang. Hi Dheeraj, I came to know that Govt. 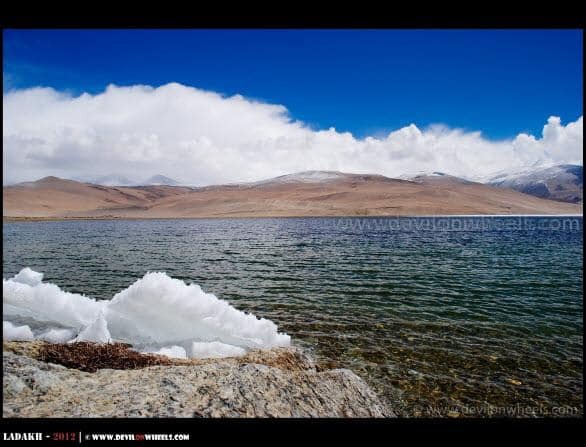 stop providing permit of pangong-hanle-tsomoriri route, is it true.Do u have any information regarding that. As of now, I guess yes they had stopped giving the permits because some idiots crossed the permitted areas, so to avoid any fuss they were not issuing permits for in last few weeks AFAI got the news. I have no updated information if DC office has resumed the permits or not. 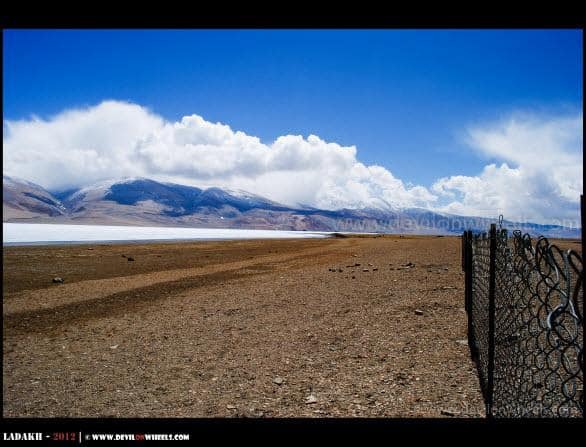 Is there any way from sarchu to padum? 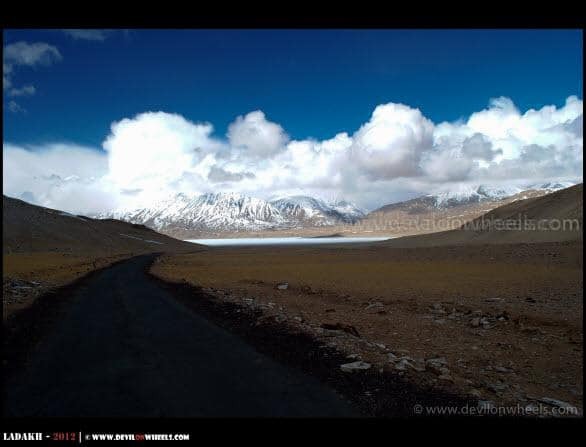 Want to cover zanskar valley also, if not then can I hire bike for zanskar from kargil? Hi Dheeraj, I came to know that govt. 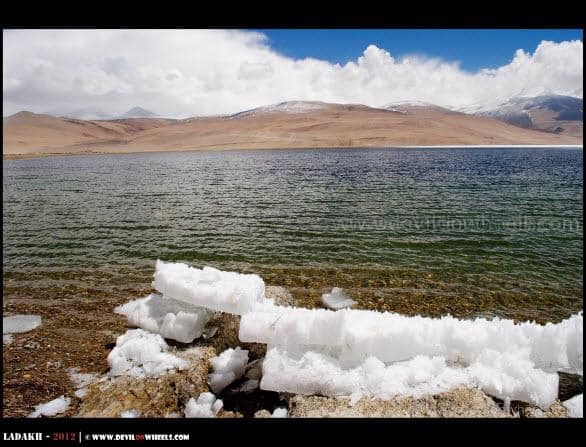 stop giving permit for pangong-Hanle-Tsomoriri route, is it true.Do u have any information regarding that. First photo is really awesome. If going on bike how to manage for fuel? Is there any patrol pump like near chumthang over this route? 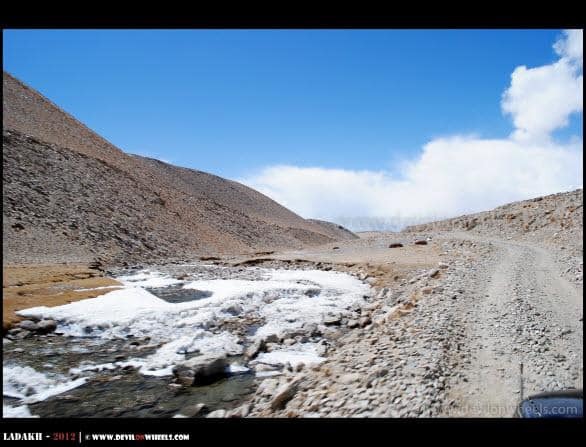 The permits to Man – Merak – Chusul route are still not being given by DC office in Leh, so keep your fingers crossed and hope for the best if they start issuing the permits. Otherwise, you have to take the traditional routes only. In case, you get them then you do need to carry spare fuel with you as their is no fuel pump available in between after Karu and even black petrol/diesel, you might get in either Tangste or Chumathang but very unlikely anywhere in between. 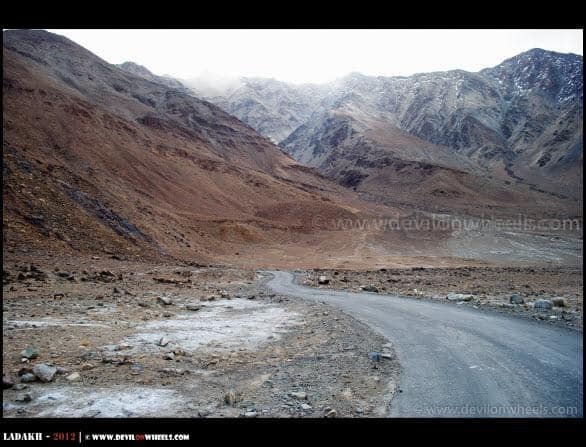 18th July – Depart for Kargil with any shared vehicle & rest there. 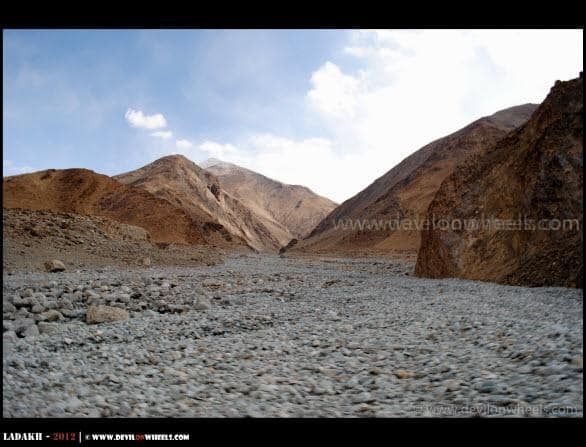 22nd July – Depart for Leh with four wheeler visit sham valley on the way. Rest in Leh. 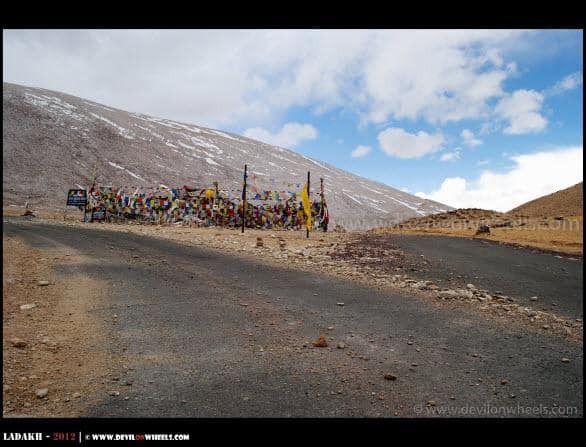 24th July – Depart for Diskit over bike, Nubra valley & rest. 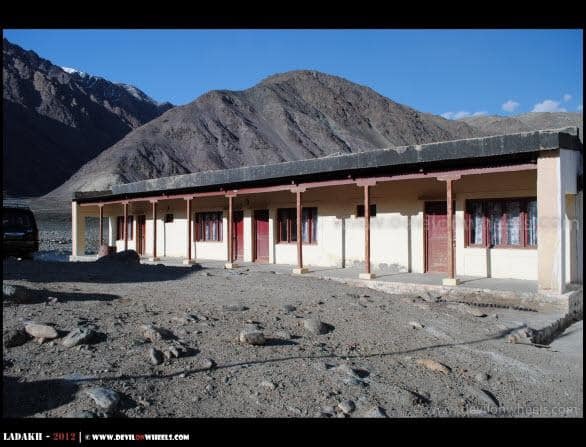 25th July – Visit Nubra whatever left. Depart for Pangong via shyok.Rest at Spangmik. 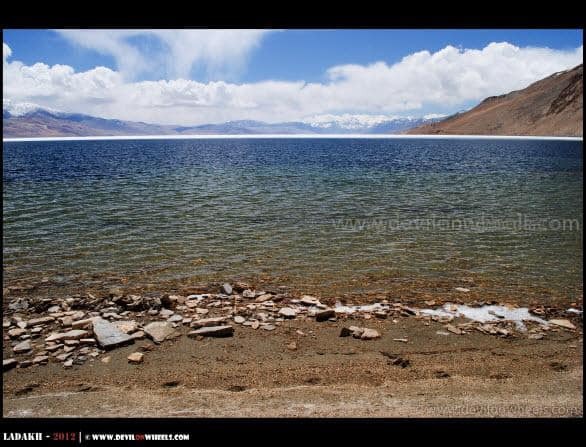 26th July – Want to spend full day at pangong. 27th July – Back to leh visiting monasteries on the way. Rest at Leh. 28th July – Tank full with fuel & Depart for Tsomoriri rest at Karzok. 29th July – Day for Tsomoriri/Tso Kar/Chumthang rest. 30th July – Back to Leh. 1st July – Rest in Srinagar. 2nd July – Fly back to Culcutta from srinagar flight at 13:30 hr. As I will be alone & going there for the first time(main motive is photography ;))Please suggest route so that I can manage my journey within stipulated time. Better will cover next time. The plan looks good now and I think you will have a wonderful time. You might not be able to do Shyok route, then be ready to follow the traditional rooute. You can check with DC office if they are issuing permits for Hanle, Chumur, Loma, Nyoma or not. If they are issuing permits for Hanle, Chumur, Loma, Nyoma then yes, you can. But, I doubt if they will be issuing. Try to request the ADC in person telling her about the passion for photography and link it with some noble charity cause. May be you get the permission. Do no take words of clerk, even if he says not possible ask him you just want to try and request her in person. Sir, one more thing to ask….. as u said i may not get permission for man-merak-chushul-hanle route but can i visit hanle via chumthang-nyoma-loma-hanle route then coming back to Tsomoriri via salsal-la-charchangla-korzok…….? 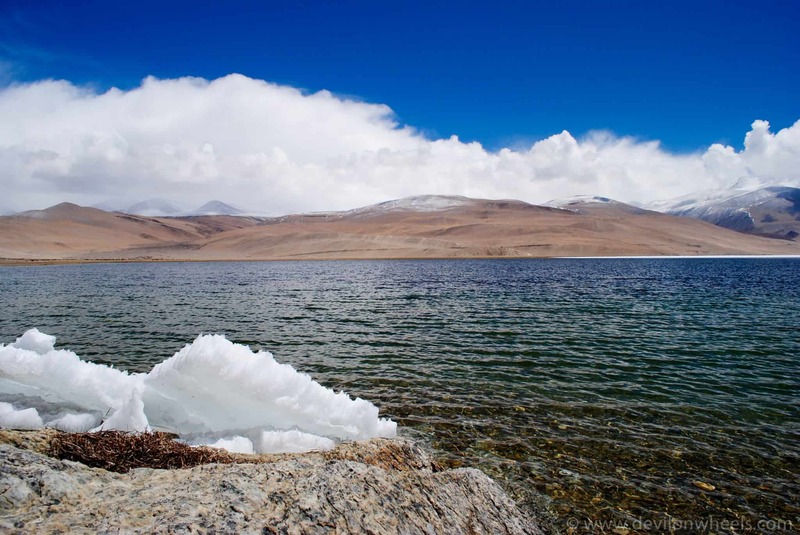 Please let me inform about the possibilities of getting permit of route Pangong tso-Hanle-Tsomoriri during the month of September (6th-17th)2012. Most likely, you will be able to get the required permits at that time as well. Ha Ha… main bhi sehmat goon, kali bhedd ke baare mein toh.